Coordinates Lat N 41:00.807" Lon W -93:47':827"
communal experiment lasted only two years. 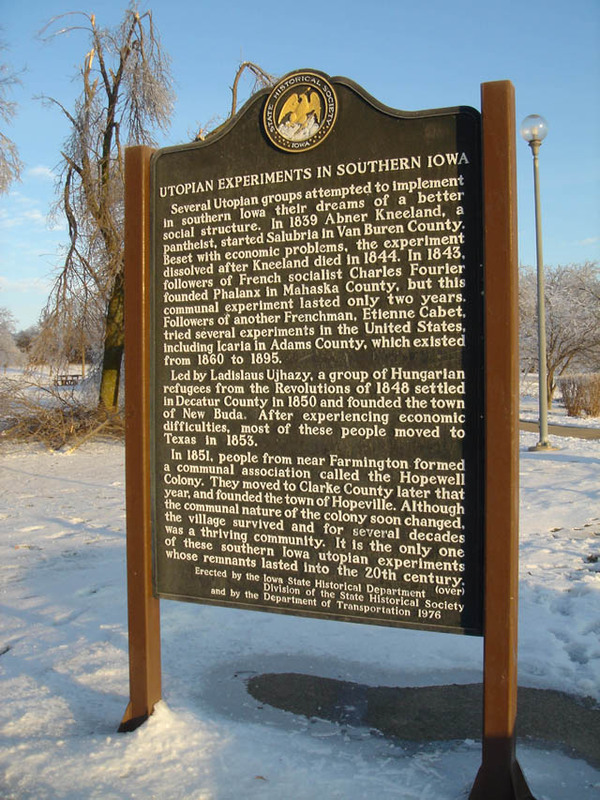 Followers of another Frenchman, Etienne Cabet, tried several experiments in the United States, including Icaria in Adams County, which existed from 1860 to 1895. Led by Ladislaus Ujhazy, a group of Hungarian refugees from the Revolutions of 1848 settled in Decatur County in 1850 and founded the town of New Buda. After experiencing economic difficulties, most of these people moved to Texas in 1853. In 1851, people from near Farmington formed a communal association called the Hopewell Colony. They moved to Clarke County later that year, and founded the town of Hopeville. Although the communal nature of the colony soon changed, the village survived and for several decades was a thriving community. It is the only one of these southern Iowa utopian experiments whose remnants lasted into the 20th century.